Meadows, thickets, sandy oak savannas, disturbed prairies. Railroad ballast. MA west to MN, south to FL and TX. Most common in the Midwest. Herbaceous perennial to 1 m. Stems slender, often branched, glabrous and glaucous. Leaves linear, flat, firm, glabrous, glaucous, under 1 cm wide, usually more than 10 times as long as wide, dilated into the sheath. Flowers in terminal, solitary cymes, subtended by a folded spathe; bracts elongate, resembling the leaves in shape and scarcely differing in size; pedicels 7-25 cm, glabrous; sepals 3, glaucous, glabrous or hairy only at the tip, often red-margined, 8-12 mm; petals 3, blue to rose or white, 1-2 cm; stamens 6, 3 of them fertile. 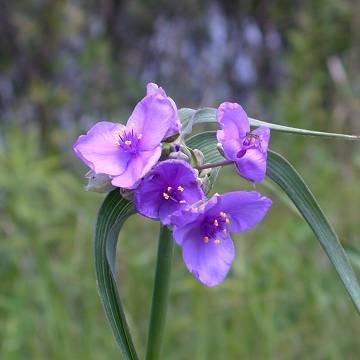 Tradescantia virginiana L. (Virginia Spiderwort) is similar but has pedicels and sepals that are conspicuously pubescent.